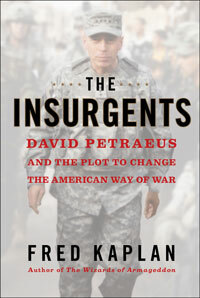 The Insurgents is the inside story of the small group of soldier-scholars, led by General David Petraeus, who plotted to revolutionize one of the largest, oldest, and most hidebound institutions—the United States military. Their aim was to build a new Army that could fight the new kind of war in the post–Cold War age: not massive wars on vast battlefields, but "small wars" in cities and villages, against insurgents and terrorists. These would be wars not only of battles but of "nation building," often not of necessity but of choice. Based on secret documents, private emails, and interviews with more than one hundred key characters, including Petraeus, the tale unfolds against the backdrop of the wars against insurgents in Iraq and Afghanistan. But the main insurgency is the one mounted at home by ambitious, selfconsciously intellectual officers—Petraeus, John Nagl, H. R. McMaster, and others—many of them classmates or colleagues in West Point's Social Sciences Department who rose through the ranks, seized with an idea of how to fight these wars better. Amid the crisis, they forged a community (some of them called it a cabal or mafia) and adapted their enemies' techniques to overhaul the culture and institutions of their own Army. Fred Kaplan describes how these men and women maneuvered the idea through the bureaucracy and made it official policy. This is a story of power, politics, ideas, and personalities—and how they converged to reshape the twenty-f irstcentury American military. But it is also a cautionary tale about how creative doctrine can harden into dogma, how smart strategists—today's "best and brightest"—can win the battles at home but not the wars abroad. Petraeus and his fellow insurgents made the US military more adaptive to the conflicts of the modern era, but they also created the tools—and made it more tempting—for political leaders to wade into wars that they would be wise to avoid. "Fred Kaplan has written a dazzling, compulsively readable book. Let's start with the fact that it is so well written, a quality so often lacking in books describing counterinsurgency. Let's also throw in the facts that it is both deeply researched and also devoid of cheerleading for the military or indeed any other kind of political bias. This book will join a small shelf of the most important accounts of the wars America has fought and will likely continue to fight in the twenty-first century." "Fred Kaplan, one of the best military journalists we have, tells the compelling story of how a cadre of officers and civilians tried to rescue victory from defeat in Iraq and Afghanistan by putting the theory of counterinsurgency into practice, revolutionizing the US Army from within. His narrative is vivid and revelatory, dramatizing a crucial piece of recent history that we shouldn't allow ourselves to forget, however painful the memory." "Fred Kaplan is one of the best in the business, a top-notch journalist and military analyst with serious intellectual chops and a killer pen. His new book, The Insurgents, tells the story of the rise and fall of the COINdinistas from Iraq to Afghanistan and beyond, and it's not only a great read—it's a major contribution to one of the most important strategic debates of our time." "A fascinating and powerful work by America's wisest national-security reporter about an epic battle: the Army's search for a way to win the wars of the twenty-first century. If you love your country, if you care about its soldiers, if you wonder about the wisdom of their commanders, read this book now." One of the 15 Best Non-Fiction War Books of All Time — Michael Inman, Curator, "Over Here: WWI and the Fight for the American Mind," New York Public Library.